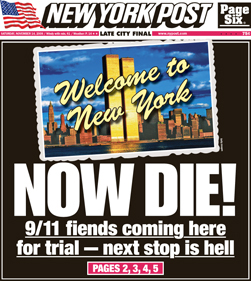 The Obama administration’s announcement that it would transfer the 9/11 mastermind and four of his accomplices to New York City for a criminal trial can only be understood as yet another cynical ploy to mollify the Left by focusing on the alleged misdeeds of the Bush administration. It certainly can’t be understood as a principled decision. The administration intends to continue on the path of holding military commissions for other captured jihadists. I know of no way to articulate a principled reason for bringing some but not all terrorists into the criminal justice system. As experienced defense lawyers well know, when there is no mystery about whether the defendants have committed the charged offenses, and when there is controversy attendant to the government’s investigative tactics, the standard defense strategy is to put the government on trial. That is, Pres. Barack Obama and Attorney General Eric Holder, experienced litigators, fully realize that in civilian court, the Qaeda quintet can and will demand discovery of mountains of government intelligence. They will demand disclosures about investigative tactics; the methods and sources by which intelligence has been obtained; the witnesses from the intelligence community, the military, and law enforcement who interrogated witnesses, conducted searches, secretly intercepted enemy communications, and employed other investigative techniques. They will attempt to compel testimony from officials who formulated U.S. counterterrorism strategy, in addition to U.S. and foreign intelligence officers. As civilian “defendants,” these war criminals will put Bush-era counterterrorism tactics under the brightest public spotlight in American legal history. This is exactly what President Obama and Attorney General Eric Holder know will happen. And because it is unnecessary to have this civilian trial at all, one must conclude that this is exactly what Obama and Holder want to see happen. From indictment to trial, the civilian case against the 9/11 terrorists will be a years-long seminar, enabling al-Qaeda and its jihadist allies to learn much of what we know and, more important, the methods and sources by which we come to know it. But that is not the half of it. By moving the case to civilian court, the president and his attorney general have laid the groundwork for an unprecedented surrender of our national-defense secrets directly to our most committed enemies. Waging war is not like fighting crime. If you are a civilian police officer and you see an unidentified person lurking where nobody should be, you ask to see ID. If you are a soldier in a battle zone, you shoot. The rules are different because they have to be different. Several months ago, author Robert Wright declared that if we cannot convict terrorists in court — for example, if evidence is tainted because of the way it was gathered — we should set them free. He specifically included Khalid Sheikh Mohammed. Wright is a principled liberal whom I met as an undergraduate, and whose intellect I respect. But this is folly. What is the government going to do if the case against KSM is thrown out of court? Tell him, “here’s 100 bucks for cab fare out of the city — good luck”? This entry was posted in Uncategorized and tagged Guantanamo, Islamic Fascism, KSM, McCarthy by Kirk Petersen. Bookmark the permalink.